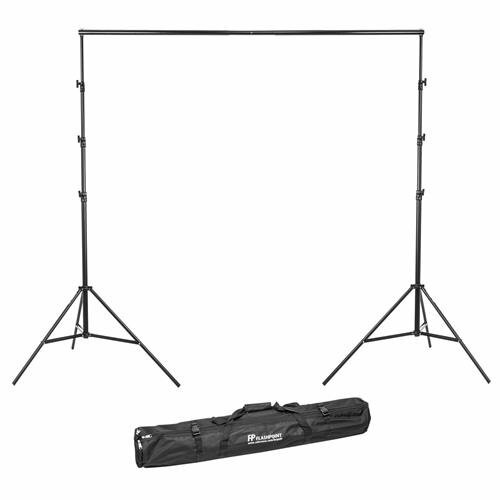 The Flashpoint 13' Background Support System is a transportable kit to support all seamless paper up to 140" in width, as well as lighter fabrics, vinyl, chroma surfaces, and muslin backdrops. Two specially designed heavy duty professional 13' support stands with locking knobs and tubular legs, act as the pillars for a tension peg spread locking 4 section crossbar. The stands were designed to be strong enough for active location use. The 4 sections positively lock together with an allen wrench keyhole system and are fixed to the stand tops with a simple wingnut. The the crossbar sections can be used to any combination of 3' foot lengths from 6', up to 12'. The whole set fits neatly in a heavy-duty canvas carry bag with a individual section for each component. While balanced for location work, the weight limit across the extended length of the crossbar should not exceed 40 lb. It is best to secure the stands with weight bags to insure safety on the set. To really take advantage of the flexible background system you own, you should add some essential accessories. Check out our vast array of muslin fabrics, seamless paper and vinyl backgrounds, as well as sand/water bags, and be prepared for a long browse. Super strong transportable support for paper, or fabric backgrounds.